The weather on Kauai is pretty balanced throughout the year. Still, knowing about this balance and what weather to expect before your trip is very helpful when it comes to selecting a place to stay on the island. If you're adamant about avoiding the rain, then, as you'll see below, the South Shore is certainly going to be your best bet. If a little rain doesn't bother you, then perhaps somewhere on the North Shore or East Shore would be better suited for you. 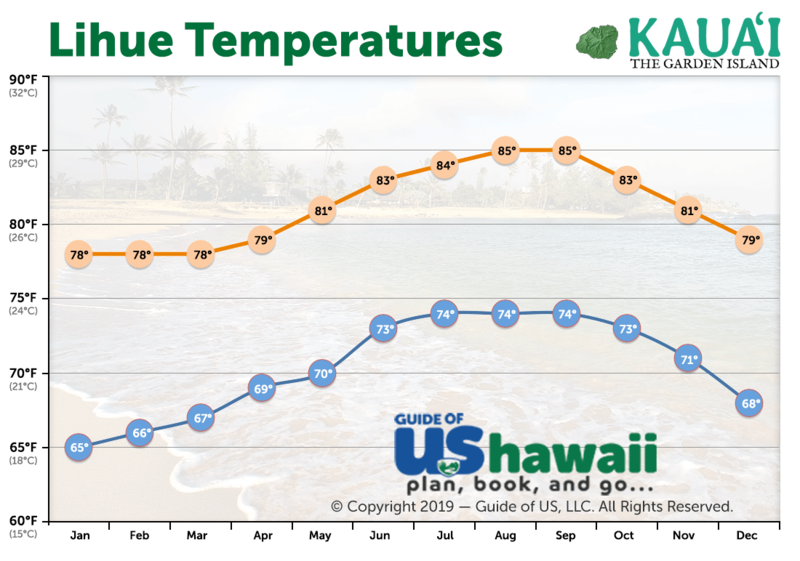 You may also be interested in our When to Visit Kauai article for additional information, as well as average monthly rainfall amounts and temperatures. For now, though, let's take a look at Kauai's general weather patterns. Kauai is known as the "Garden Isle" for good reason - it's lush, green, and wet (home to one of the top two wettest spots on the planet, actually). Many folks who love Kauai do so because they know its verdant appearance is thanks to a happy medium of both sunshine and rain. Plus, this means more rainbows. To date, we can certainly say we've seen more rainbows on Kauai than anywhere else in Hawaii; often double and even triple rainbows depending on the location - it's a sight to behold! 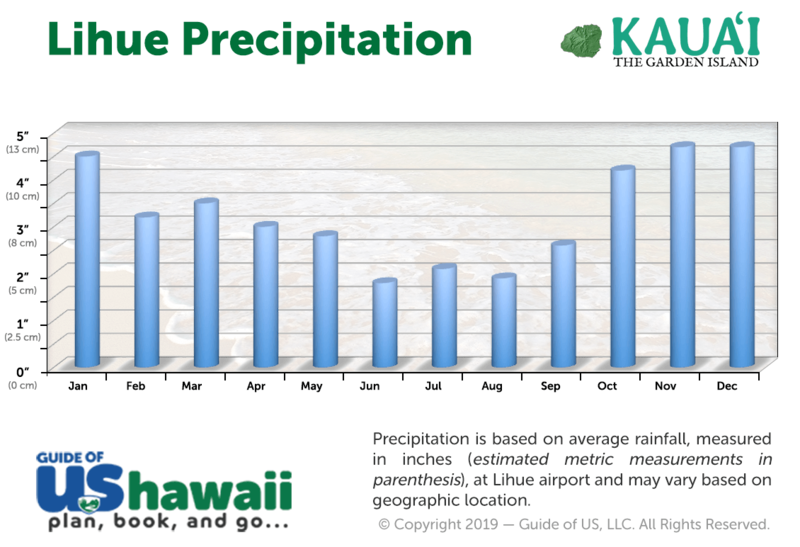 When you begin to plan your Kauai trip you'll likely want to know which areas offer the most sun and the driest weather. This is especially important to consider during the winter months when the tradewinds bring additional moisture to the islands. Below is an ordered list of the driest/sunniest locations to the wetter locations on the island, year round. We'll start with the driest. Waimea is probably the driest of all the areas on the island but offers fewer accommodation choices than other locations. Poipu or Lawai, which offer an abundance of accommodations on the South Shore, is your best bet for a dry and sunny vacation. The area averages about 30-40" (76-102 cm) of rain each year. Kapaa on the Eastern (Coconut) Coast is your next best choice, averaging about 50" (127 cm) of rain annually. The fourth location is also the wettest, but offers gorgeous scenery and lush surroundings - it's the North Shore: Princeville, Hanalei, Kilauea, etc. This area gets around 85" (216 cm) each year. In choosing any of these locations, consider which activities you'd like to participate in. Would you prefer hiking, beach lounging, swimming, or snorkeling? Keep these things in mind when selecting your location. The good news is that Kauai is small enough to reach almost any area of the island within an hour or so. If you find yourself in a rain shower one minute, it'll typically be sunny again just up the road. Ultimately, it's hard to pick a bad location on Kauai to stay for your vacation. Be sure to check our Where to Stay on Kauai article, as well, for more information about each area of Kauai. 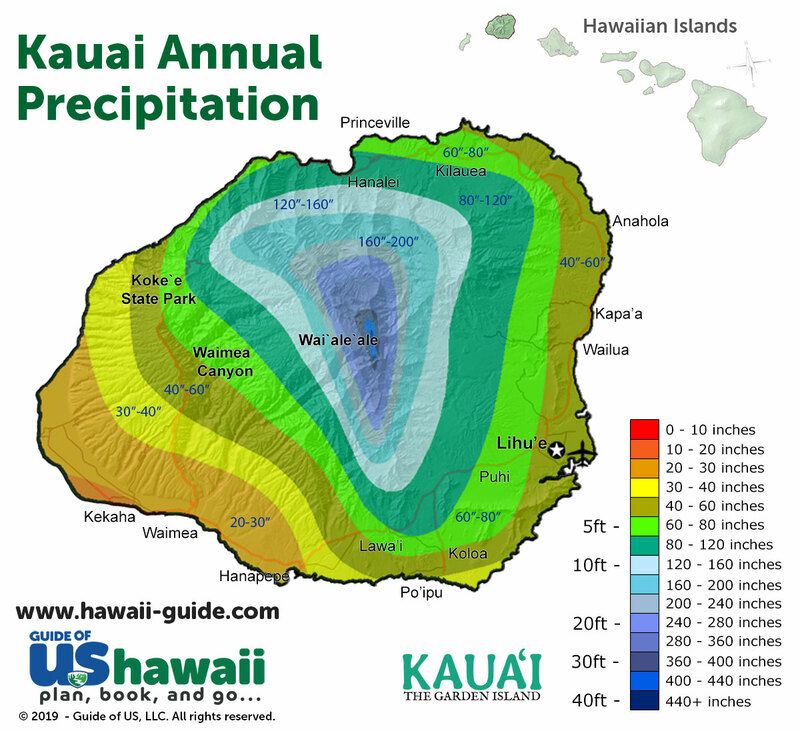 Also, you'll find more information about Hawaii weather in our Hawaii Weather and Climate Patterns article. The map below should also help you visualize which areas are the wettest and driest on the island. Pick your favorite way to explore and you can surely do it on Kauai. Hit the trail on horseback for a beautiful adventure, snorkel the pristine waters, or explore the island- and it’s spectacular NaPali Coast- in a helicopter for a truly unique perspective. From the rugged peaks to the lush valleys, these Garden Isle tours will leave you speechless. When’s the best time to visit Kauai? What are the best sights? Where should I stay? Which beach is perfect for kids? Everything you need to plan, book, and go to Kauai is right here! Personalize your R&R with our handpicked selections of the best Kauai accommodations. Up for some poolside pampering and a luxury experience? How about a family-friendly vacation rental for the whole gang? Prefer peace and quiet and an intimate setting? Then a cozy bed and breakfast is perfect for you. Book your Kauai stay today.